Charles Smiley with his latest 2011 release. The CSX on parade at the close of the 20th century. A few geographic areas are shown with busy tracks. Featured locales are: Ohio Hotspots, Cumberland Sub, and Sand Patch Grade. The ‘scrapbook’ theme is a fine premise for a program. There are a huge number of trains shown in this program. Shown in all 4 seasons, the wide variety of power, locations, and scenery, equal fantastic railfanning! Drawing mainly on 1999-2000 footage, also included are some 1991 and 1993 views. CSP is always one with some bonus features. Here, the earlier film provides a differing viewpoint, with renumbered Chessie units still in mainline service. High quality is a hallmark of a CSP show. This one, is no exception to that standard. Diesel fans will have a field day with the vast array of EMD and GE power that is shown. CSX was power short and leased units are abundant. Some are in the paint schemes of former roads with quick patched paint and logos. Intersecting roads such as Norfolk Southern and even Union Pacific are seen. Run through locos are from roads such as BNSF and CNW are found. Canadian National, Illinois Central add variety. Helm Leasing, FURX are some of the leased diesels. CSX had a large roster. Many different locomotive types are viewed. There are many assorted CSX paint schemes too. Renumbered Conrail units are included. The head-end never is repetitive on this show. Long lash-ups, Helper Service and long trains are plentiful. Charles intersperses some individual locomotive history on CSX repaints. He also has discussion, and views of the replacement, of old B&O color position signals. Fostoria. 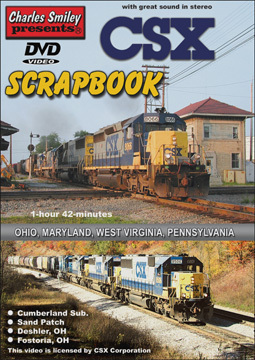 Ohio has 3 former mainlines from: B&O, C&O and NKP. This is known as ‘The Iron Triangle’. It is a renowned modern hotspot. At this time, CSX and Norfolk Southern cross here. These are all double track mainlines. Cumberland subdivision begins at Point Of Rocks, MD. We will move west from here, as we tour this subdivision on CSX. Martinsburg, WV. does see many assorted freights. There are enough general merchandise moves to keep up the interest level. Sand Patch grade is one of the most famous in the United States. This show devotes two chapters. The heavily wooded scenery is a nice backdrop for train-watching. Mountains, tunnels, bridges and rivers all add to the scenes. Earlier 1991 shots reveal quite a lot of Chessie System painted power was still visible. Before we complain about wanting more Chessie, remember these flashbacks are included as bonus footage. He is not required to do this, Charles likes to give viewers the complete picture of any given subject. His attention to the many small details are part of what sets a CSP show apart. Charles has a rich supply of detail with on-screen graphics. Locations, direction, car counts and additional info are often listed. Another consistent CSP extra are the custom made maps. These are important to get a sense of an area, locations and even elevations. They are frequently referenced and add better understanding of the lines. Historical background of each line often discussed. The scenic beauty of the region multiplies as we travel into Pennsylvania and towards Sand Patch Grade. Contemporary equipment gives some of the best imagery from this area. Digital processing has been used throughout the program. The footage has been digitally enhanced for improved picture quality. Audio is crisp and clear, as well. Natural sounds of the trains are quite prevalent in this program. Narration by Charles, is in a more concise style. He still is informative. The trains do take center stage more often. Sand Patch Grade is a centerpiece of this fine show. There are some excellent, uninterrupted train-watching sequences to see. The elevation maps are another inclusion that defines the territory covered. Remember, this has a scrapbook assortment! Charles swings out, to display CSX power in run through roles. This is an excellent assortment of CSX trains. The extra fine picture and sound qualities are a highlight. Any railfan will find enjoyment in the sheer volume of train scenes. Once again CSP just does superior work. You just can’t go wrong with a Charles Smiley Presents. This entry was posted in ATVR Reviews, Charles Smiley Presents and tagged American Train Video Reviews, B&O, C&O, Conrail, CSX, new releases, Norfolk Southern, Railroad, Train DVD, Union Pacific by William J. Hudson. Bookmark the permalink.